The reality of Parkinson’s: Parkinson’s is a common neurodegenerative disorder. Approximately 60,000 new cases/year of Parkinson’s occur in the USA, and they join ~1 million people living here with this disorder. Life expectancy between the general population and patients with Parkinson’s are very similar. A public health study found that those who lived with Parkinson’s for 15-20 years had only a slightly shorter life expectancy than the general population without the disorder. Knowledge and information about Parkinson’s is moving forward at a sustained pace. 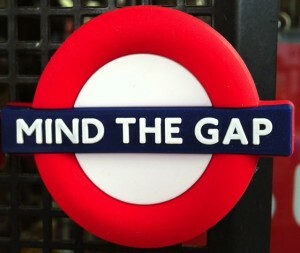 We know a lot, really we do; however, there are still gaps in our understanding. W hav mad trmndus advacs tratg smptms of Parknsn’s, altug a cur or owing nurodgnrtn s nt yt a ralty. We have made tremendous advances treating symptoms of Parkinson’s, although a cure or slowing neurodegeneration is not yet a reality. A new gap may have been filled, a possibility for a new target for therapy: As a scientist with Parkinson’s, I can sense the frustration with the public’s patience with the rate of advancing knowledge to curing this disorder. However, my scientific training is in sheer awe of the real advances occurring in research laboratories and medical clinics dealing with new treatment strategies and the unraveling of the molecular details of Parkinson’s. Scientists at University of Alabama at Birmingham (UAB) published a very nice article describing a small molecule (drug) that inhibits the mitochondrial enzyme with the catchy name of “leucine-rich repeat kinase 2″ (LRRK2, pronounced “lark two”). What is LRRK2 (i.e., lark two) and how does this relate to Parkinson’s? •Scientists have discovered several Parkinson’s-causing genes mostly in early-age onset forms; strongly linking a genetic component to the cause of this disorder. •Interestingly, mutations have been found in the LRRK2 gene in patients classified with typical ‘sporadic’ Parkinson’s ( 60-70 years old at diagnosis); resulting in a paradigm shift linking a possible genetic cause of the more typical form of Parkinson’s. •Some Parkinson’s cases have a specific mutation in LRRK2 at amino acid residue 2019, termed G2019S, which ‘turns-on’ the kinase activity of LRRK2; this indicates that increased activity of LRRK2 G2019S plays a role in progression of the disorder. •The LRRK2-G2019S mutation has been found as a common cause of Parkinson’s: ~5–6% of familial Parkinson’s and ~1–2% of sporadic Parkinson’s in the USA and several European populations. •As described here before, the protein α-synuclein is linked both in the human disorder and in animal models of Parkinson’s (https://journeywithparkinsons.com/2015/06/21/of-mice-and-men-endogenous-alpha-synuclein-contributes-to-mitochondria-inhibition-in-parkinsons/ and https://journeywithparkinsons.com/2015/05/23/the-alpha-synuclein-story-in-parkinsons/ ). 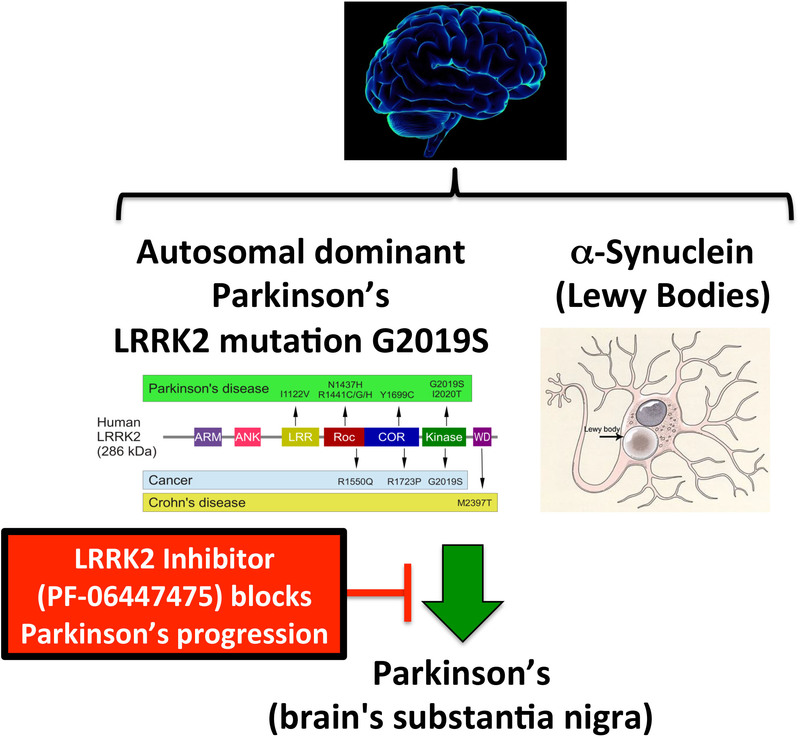 •The UAB group showed that rats deficient in LRRK2 (“gene knockout”) were protected from neurodegeneration in the α-synuclein-overexpression rat model; these results imply a role for LRRK2 in the progression of Parkinson’s. •They next used rats that were making human G2019S-LRRK2 in the human α-synuclein-over-expressing rat model (in the substantia nigra). Rats were fed a drug for four weeks that was a specific LRRK2 inhibitor. Compared to control rats not fed this novel drug, test rats were protected from neurodegeneration. •The small-molecule inhibitor made its way from the gut to the bloodstream and then through the blood-brain barrier to reach the brain and the substantia nigra. •The drawing below is an attempt to depict the small-molecule inhibitor (drug) to prevent neurodegeneration in the rat model expressing human LRRK2 and α-synuclein to promote Parkinson’s. There is real hope for slowing the progression of Parkinson’s. The research being performed on Parkinson’s all-over-the-world leaves me hopeful for new strategies to this disorder. New ideas by good scientists have us on a hopeful path. And yes, I’m convinced these types of novel findings will eventually (sadly, years from now) begin to benefit humans with Parkinson’s. Genetic characteristics of leucine-rich repeat kinase 2 (LRRK2) associated Parkinson’s disease: http://www.ncbi.nlm.nih.gov/pubmed/21641266 .